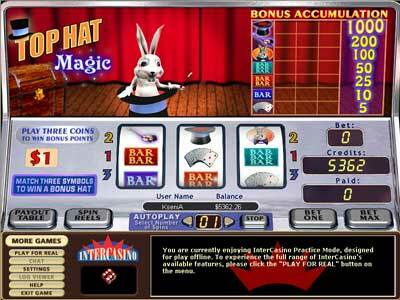 Top Hat Magic $1.00 Slots are 3 reels, 3 paylines slot games with a bonus loyalty feature and a Magical theme. To qualify for the bonus feature you need to choose maximum 3 coins bet. Players have the chance to win a 1,000 coin jackpot. Coin value is $1 fixed. Winning combination symbols are the Top Hat, Rabbit in Hat, Magic Wand, and a deck of cards in combination with BAR symbols having 3 different colors. After betting 3 coins, when you see 3 of the same symbol appearing on a payline and amounts appearing on payout table, you will get a Hat. Once you have achieved 3 Hats on any particular row in the bonus table, you will win the bonus amount. You can get a dividend of 50 coins after matching 3 of the triple BAR symbols, and 25 coins after matching 3 of the red double BAR symbols. You can get 10 coins after matching 3 blue single bars. Again, after getting 3 card symbols on a payline, you will be rewarded with 5 coins. With these exciting payouts, you can magically increase your cash by playing Top Hat Magic $1.00 Slots.